Multinationals are faced with Transfer Pricing Documentation requirements. Reptune® allows you to coordinate your Transfer Pricing compliance and to generate complete and consistent BEPS Action 13-compliant Transfer Pricing Documentation worldwide, with the click of a button. Reptune® contains a highly sophisticated Transfer Pricing Documentation-writer. Its technology is unprecedented in the market. It is designed for coordinating and preparing worldwide, best-practice Transfer Pricing Documentation. 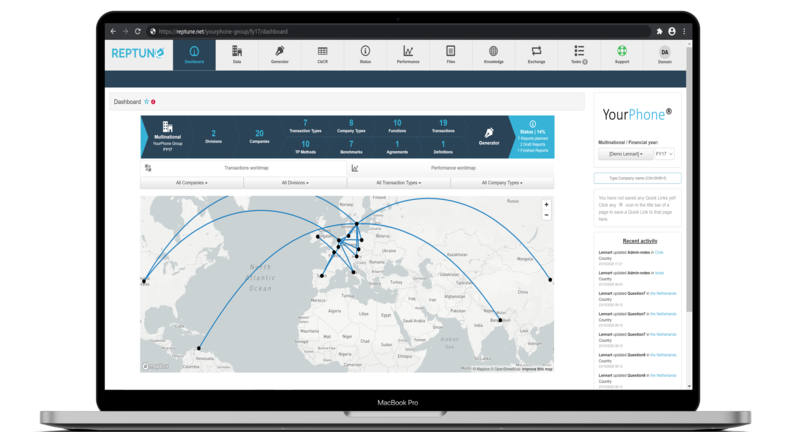 Reptune® has sophisticated dashboard features and a user-friendly interface to manage the required data and is a highly cost-efficient solution for both tax advisers and multinationals. Since Reptune® is a web application, it requires no software installation and is suitable for any operating system. 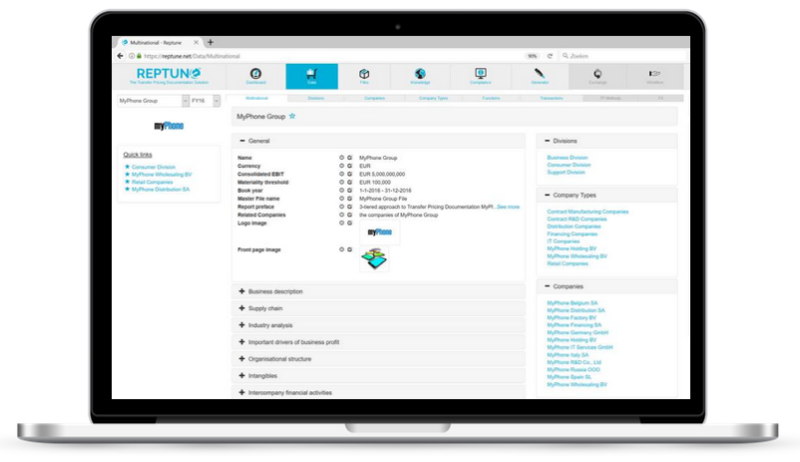 Reptune® follows a top-down approach where data management starts from the global perspective of the multinational and drills down to a single group company and its individual functions. The documentation that is generated by Reptune® has been reviewed by tax advisers, statutory auditors, tax inspectors and tax departments of the largest multinationals around the world. Their feedback is used every single day to further improve Reptune®. Our team of Transfer Pricing professionals monitors the Transfer Pricing Documentation requirements in all countries in the world, assesses material deviations from the BEPS Action 13-requirements and incorporates those in the documentation format. Reptune® has a transparent cost structure and is highly cost-efficient. Our clients can choose between the Full Service-plan and the Do-It-Yourself-plan. With the Full Service-plan clients have the full support of our team of Transfer Pricing professionals to prepare their Transfer Pricing Documentation. With the Do-It-Yourself plan, support is available on demand. Reptune® and our team of Transfer Pricing professionals (operating through TP Tuned BV) are deeply specialised and solely engaged in the preparation and coordination of Transfer Pricing Documentation. As a result, we are highly efficient and experienced in this field. TP Tuned BV is an independent Transfer Pricing services provider without auditor independence limitations. Reptune® operates through a highly secure infrastructure and makes backups daily. Your administrator(s) can determine the access of individual users. Reptune® uses a number of algorithms to verify the correctness of data and flags inconsistencies to the user. 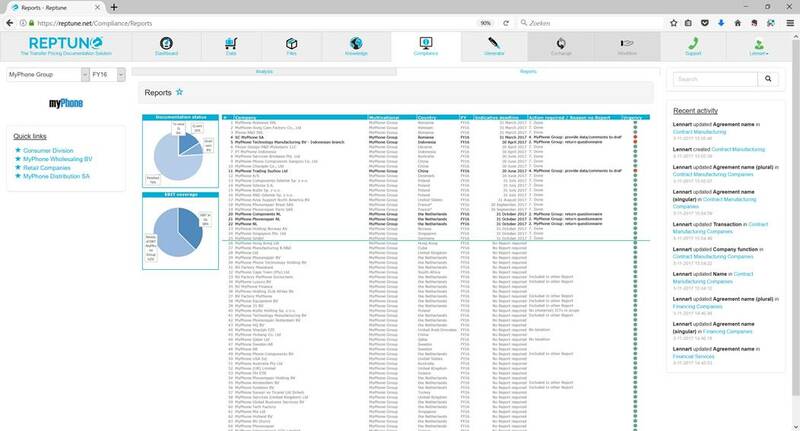 Reptune®’s dashboard and compliance overview provide visual insight into transaction flows, documentation progress and financial performance. Documentation prioritisation is based on local documentation deadlines. Transfer Pricing (Documentation) is a complex area. Through its top-down approach, the Reptune® user is guided through the data that needs to be completed. A tab-structure facilitates easy navigation. Reptune® indicates which information is missing in order to prepare an individual Transfer Pricing Document. After completing all the required data, users can determine the contents and sequence of a Transfer Pricing Document and generate it with just the click of a button. Reptune® has simple but effective workflow management features. Users can assign review tasks and monitor tasks and deadlines. Our experienced Transfer Pricing professionals and Developers are available real-time to support your team. Depending on the plan that best suits your company, our team of Transfer Pricing professionals fully operates Reptune® on your behalf (Full Service plan) or provides support on demand only (Do-It-Yourself plan). Users benefit from our Transfer Pricing news services and online knowledge centre, which provides access to guidelines, news and summaries of Transfer Pricing legislation of all countries. Reptune® has been developed based on years of research, experience and feedback from clients, advisers, statutory auditors and tax inspectors. Reptune® was created by the Transfer Pricing professionals of TP Tuned. Reptune® was built on years of experience by the Transfer Pricing professionals of TP Tuned. Our professionals have significant Big 4 and in-house experience and have developed Reptune®’s documentation methodology in practice. We support our clients with day-to-day, practical Transfer Pricing advice to support their teams to get things done. Request a free offer or let us know if you have any questions. Receive the latest news on Transfer Pricing. Download the official OECD Transfer Pricing Guidelines PDF here. Getting started with Reptune® is easy. Request an offer now. Reptune is a software product of TP Tuned BV. This website is published by TP Tuned BV The material presented on this website does not constitute legal or other professional services or a client relationship. TP Tuned BV is not responsible for the content of any external website that refers to www.reptune.net. All material on this website is protected by copyright laws and may only be reproduced, distributed, transmitted, displayed, published or broadcast to the extent permitted by those laws and with the prior written permission of TP Tuned BV This applies to text, visuals, trade names, trademarks, photos and all other materials. TP Tuned BV can be contacted at info@reptune.net.